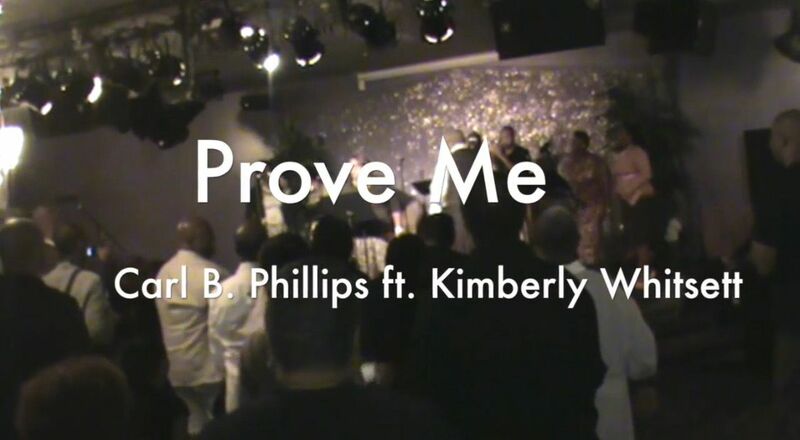 Carl B. Phillips Releases Lyric Video For Gospel Song "Prove Me"
DETROIT - Sept. 24, 2018 - PRLog -- Gospel recording artist Carl B. Phillips recently released a lyric video for the upbeat gospel song "Prove Me" from his debut cd "Great Rain". Carl states that the song was inspired by the old testament scripture, Malachi 3:10, "Bring ye all the tithes into the storehouse, that there may be meat in mine house, and prove me now herewith, saith the Lord of hosts, if I will not open you the windows of heaven, and pour you out a blessing, that there shall not be room enough to receive it." The song was birth during a time Carl was facing some financial challenges and needed to 'Prove' God to keep his word. This season in Carl's life taught him to lean and depend on God to be his source, and true to the scripture Carl saw God, "open the windows of Heaven and pour out blessings he didn't have room to receive." "Prove Me" was co-written by Carl, along with Brandon Holland (J. Moss, Darlene McCoy, Vanessa Bell Armstrong) and Donny Russell. The song features powerhouse Detroit gospel vocalist Kimberly Whitsett, (The Michael Fletcher Chorale, and the GMWA Detroit Chapter Choir), and highlights rhythmic urban soul similar to that of the legendary R&B singer Ann Nesby. The video was recorded at the Upper Room in Detroit MI, during the live recording session of Carl's debut cd "Great Rain". Carl B. Phillips is a gospel recording artist, songwriter and producer from Detroit, MI. His debut cd "Great Rain", features the singles "Great Rain", "I Know What God Did Last Summer" and "Meeting In The Air". Carl has performed live in Los Angeles, Las Vegas, Nashville, Atlanta and Chicago. His television appearances include, TV-57 Atlanta Live, The Dorinda Show on TCT Network and Dr. Bobby Jones Presents on the Impact Network. Locally, Carl has performed in the Ferndale Front Porch Concert Series, the 2017 Michigan State Fair and Detroit Music Weekend. Carl's goal in life is to spread good news with uplifting music. Carl B. Phillips and Friends cd "Great Rain" is available on all digital outlets. Follow @carlbphillips on Facebook, Twitter, Instagram, Soundcloud and Reverbnation.